Financier Bill Browder, a high-profile critic of Russian President Vladimir Putin, has been briefly arrested in Spain on a Russian arrest warrant. 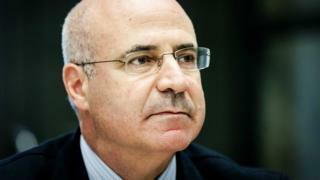 Mr Browder had earlier tweeted that he had been arrested on a Russian Interpol arrest warrant. Interpol rejected the claim, saying: "There is not, and never has been, a Red Notice for Mr Bill Browder." The agency said in a statement: "Mr Browder is not wanted via Interpol channels." But there were multiple accounts about how the confusion arose, and why Mr Browder was detained. A police spokesman told AFP: "An arrest warrant has a date limit and when that expires, it must be deleted from the computer programme and in this case Interpol hadn't deleted it." But the US-born financier, who is a British citizen, tweeted that a new notice had been issued. "Spanish National Police just released me after Interpol General Secretary in Lyon advised them not to honor the new Russian Interpol Red Notice," he said. "This is the sixth time that Russia has abused Interpol in my case." Interpol had previously refused to enforce a 2013 warrant for the investor, deeming it "predominantly political in nature". British Foreign Minister Boris Johnson said he spoke to Mr Browder and was "very glad that he has now been released". "Moscow should concentrate on bringing those responsible for the murder of #Magnitsky to justice," he tweeted. Mr Browder was in Madrid to give evidence to a Spanish prosecutor about money from the Magnitsky case that was moved to Spain. He said the arrest while on such a trip was ironic, but added: "Now that I'm released my mission carries on."